All of your transportation needs are here. Find a limousine for a wedding, prom or party. 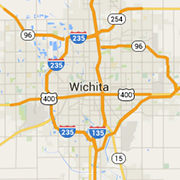 Wichita rental cars, airport transportation, taxi cabs and more. Since 1956, Best Cabs has been a leader in the transportation industry. It is the oldest and best taxicab company in Wichita. Our luxurious party buses include climate control, side facing seats (room for dancing!) LED lights, an unbelievable sound system, and a lively, professional driver!